Clinton Sipes since childhood living with an atmosphere of violence in the family. He often became victims of physical violence and anger his father who was a alcoholic. He grew into a teenager who has an anti-social behavior and happy to do violence to anyone, at her brother, on classmates, teachers even in animals. Sipes violence perpetrated in the level even sadistic. As a teenager, Sipes prefer to join a gang of youths who also have problems like himself, consuming alcohol, drugs, committing a crime, and racial violence. At the age of 13 years Sipes must live a life in prison the children and the sad condition of the school which is said to reform children's behavior problems had even a worse influence on Sipes. Sipes propensity to violence and racial being strengthened. Sipes hated blacks, Jews, asia and the bureaucrats. After three years in the penitentiary children, Sipes free and he became a "grenade" is ready to explode. To channel the violent passions, Sipes joined racist groups and often participate in "offensive operations" against certain ethnic groups and he is involved in various criminal activities. So at the age of 16 years, Sipes returned to prison in California. He was sentenced to 6 1 / 2 years on charges of robbery and possession and use of firearms. In prison, Sipes joined the group "white supremacist" who hate all the people who are not descendants of "Anglo-Saxon." He also began a correspondence with the klu Klux Klan (KKK), which then demanded the release of her bail. Once free, Sipes active in the KKK group for 3-4 years. He and his group carried out the attack at night, do the beatings and other milikorang property damage. Until he was in and out of jail for violating bail given the prison authorities and continue to happen until the 20-year-old Sipes. At the same age Sipes began to miss the peace in his soul. He regretted the evils he had done so far and the feeling is often made him angry and the anger and kebenciaannya spill all over itself, the warden, prison warden. Often he awoke in a state of half-naked in solitary confinement. Solitude in the isolation cell was made to rethink the past and negative things he does. "When I was in prison, my daughter was born. I started thinking about the future. I started thinking about how many casualties due to my act. I could see myself life would be in prison, with no future," said Sipes. "Deep down I said 'Clint, you have to choose between evil or good future'. Obviously if I choose evil, I would have no future. My family, mother, brother, they would all be afraid of me. They going away from me, "he continued. The thought was that encourages Sipes to cure the disease "cancer" of anger and hatred within him. He wants to love and be loved like that diiginkan everyone. "I do not want to hate anymore," he said. After completing the period of incarceration and escape from the conditions for bail, in the town of Montana Sipes began engaging with human rights organizations, especially those that provide protection to children. He helps kids who have problems that he had ever had in childhood. However, Sipes still not completely break away from criminal activity until he had to go to jail again for three years on charges of having explosives. In the federal prison that he met a Muslim African-American who assist prisoners who need assistance. Of people's curiosity Sipes came to Islam. He thinks that Islam is a religion exclusively for African Americans. As a white person, Sipes reject Islam. However, Sipes still ask many questions about religion and start thinking positively about Islam as a religion whose teachings are not universally known ethnic or racial. "I got interested. For me, Islam is very real and pure sounds," says Sipes. African-American Muslims were then invited to see the implementation Sipes performed Friday prayers in congregation and gave him the Quran. Sipes read translations of the Quran and claim to feel the truth and purity of doctrine written in the Koran. Sipes increasingly feel the vibrations of his heart to Islam when he heard the call to prayer. "At that moment I felt the closeness of God in my heart and soul," he said. After doing research and studying the Quran I find the perfection of the teachings of Islam, there is no contradiction in it. Unlike other religions that believe in many gods or idols, Islam is a religion based on the belief that God is One. Sipes also impressed with the "mukzizat Al-Quran" scripture thousands of years old but already berumu kemurniaannya maintained. Neither of the letters and even words in the Quran are altered or changed. After identifying the religion of Islam, little by little Sipes behavior change. Of the people who cause a lot of trouble, full of hatred and anger, Sipes become a calmer person. 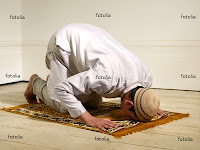 "Islam gives me the spiritual needs, tranquility and inner peace that I can not explain with words. In Islam, my purpose in life is clear, towards the straight path," said Sipes. Sipes decided to utter two sentences creed and use the name Abdus Salam. "Thank God, after I discovered the truth of Islam and became a Muslim, I feel reborn and wanted to grow up to be a good new man and devoted to Allah," said Abdus Salam Clinton Sipes.